Who's gonna drive ya home? Payments as low as $21/mo. The Gain knob covers tones from very light overdrive to monstrous distortion. The unique Mid Boost gives natural sounding boost in the lower mids that can fill out lightly overdriven tones, and can give single coil instruments the girth to compete with their humbucking brethren. The Tone knob gives you broad control of your high-frequency content and the Presence control lets you add clarity to your high end without getting piercing or sterile. The Winford Drive is one of the most versatile guitar effect pedals ever made. It not only gives the player access to a huge variety of tones via its simple, powerful controls but works with your playing dynamics and guitar's volume control to make the Winford an ultra-responsive and dynamic part of any guitar rig. XAct Tone Solutions builds products and provides services designed to deliver on both tone and dynamic feel with professional performance, extraordinary quality, and outstanding value. Our guitar FX pedals are musical, working with your instruments and amplifiers to produce classic and modern guitar tones. The best in overdrive, distortion, and fuzz sounds can be had with XTS effect pedals. The XTS Custom Shop in Nashville builds some of the world's best guitar rigs. Each one is as unique as the person playing it. From a few pedals, to huge racks; from small true-bypass loop switchers, to large MIDI controlled FX routers; we have the experience and the expertise necessary to build the best performing and sounding guitar effect systems. 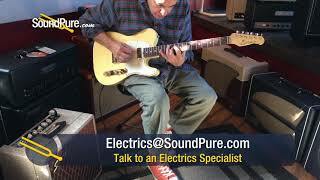 DIMENSIONS: 2.6" x 4.8" x 2.0"
In this video, Sound Pure electric guitar specialist Eddie Berman tests out the Suhr Custom Classic T Antique Vintage White Electric #JS9L8F with a Suhr Bella Reverb Head & 1x12 Cab (Black Tolex), an Xact Tone Solutions Winford Drive Guitar Pedal, and a Strymon El Capistan dTape Delay Effect Pedal. 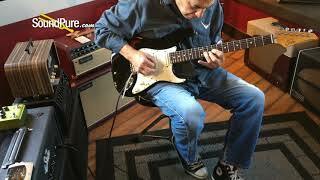 In this video, Sound Pure electric guitar specialist Eddie Berman tests out the Anderson Cobra Trans Black Electric (#01-28-18N) with a Suhr Bella Reverb Head, a Suhr Bella 1x12 Cabinet, a Strymon El Capistan - dTape Delay Effect Pedal and a Xact Tone Solutions Winford Drive Guitar Pedal. 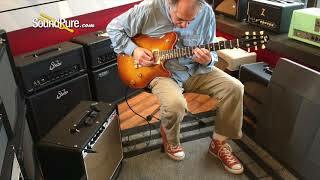 In this video, Sound Pure Electric Guitar Specialist Eddie Berman tests out the Michael Tuttle Carve Top Deluxe Ice Tea Burst #10 (Used) with a Carr Sportsman 19W 1x12 Combo Amp, a Strymon Brigadier dBucket Delay Effect Pedal, and a Xact Tone Solutions Winford Drive Guitar Pedal. 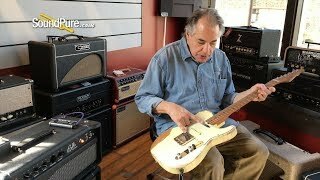 In this video, Sound Pure Electric Guitar Specialist Eddie Berman tests the Michael Tuttle Tuned T Vintage White Electric #452, with a Xact Tone Solutions Winford Drive Guitar Pedal, Strymon El Capistan - dTape Delay Effect Pedal, and Swart Smallbox Mod 84 "BC Model". 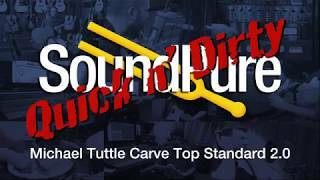 In this video, Sound Pure electric guitar specialist Eddie Berman tests out the Michael Tuttle Carve Top Standard 2.0 Ice Tea Electric #3 with a Suhr 2017 Badger 18 Amp Head, a Suhr 1X12 Veteran 30 Speaker Cabinet, a Strymon Brigadier dBucket Delay Effect Pedal and a Xact Tone Solutions Winford Drive Guitar Pedal. 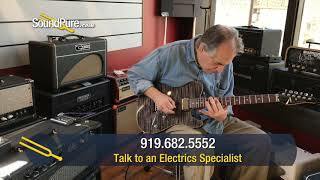 In this video, Sound Pure electric guitar specialist Eddie Berman tests out a Suhr Classic Antique Pro Black Over 3 Tone Burst (Serial #JS1W8E) with a Suhr 2017 Badger 18 Amp Head, a Suhr 1X12 Veteran 30 Speaker Cabinet, Strymon Brigadier dBucket Delay Effect Pedal and an Xact Tone Solutions Winford Drive Guitar Pedal.